When I was home this fall, I wrote about the two-mile northern extension of the Cape LaCroix Recreational Trail from the Kingsway Dr. / Lexington Ave. trailhead. At the time, I said that it looked complete except for a short stretch that still needed paving. Wife Lila and Mother took a drive by there in December and saw that the paving is done. Thanks to Lila for shooting these. I don’t know if the stretch is officially open, but it was already being used when I was there in October. 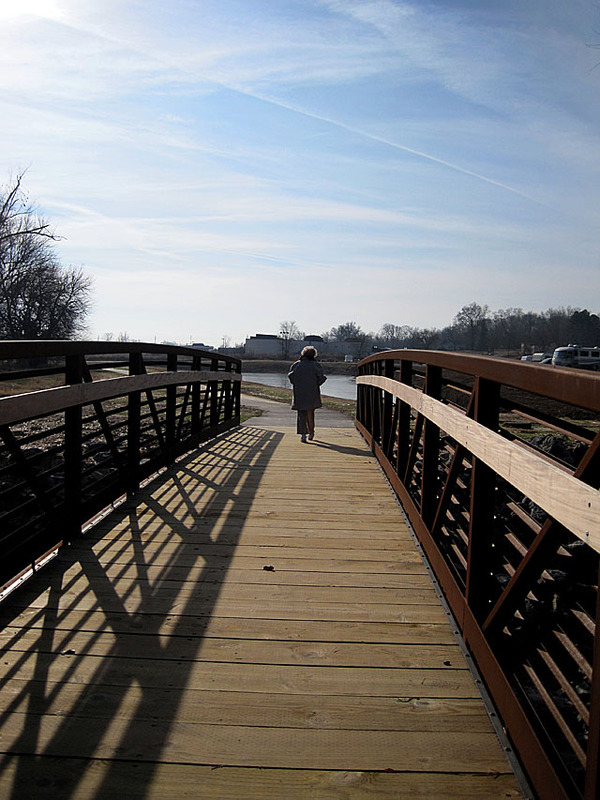 In other good news, The Southeast Missourian had a story December 28, 2010, saying that even more trail expansions are in the works for the coming year. What I find particularly exciting is that the city is changing from thinking of the path as a recreational trail and is looking at it as an alternative transportation corridor. The project would have two segments to improve the connections between the area along West End Boulevard near the Shawnee Sports complex and the rest of the city, said Ken Eftink, assistant city manager and director of development services. It’s not the length of the new trails that will matter, Eftink said, but where it will be located. 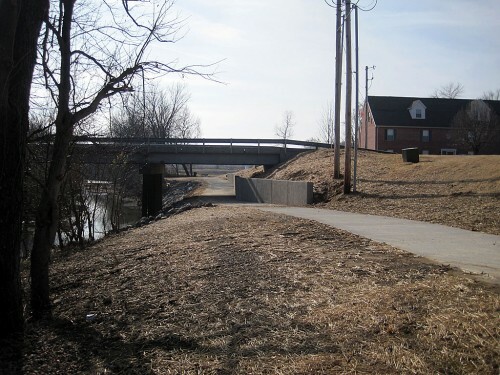 The main segment of new 8-foot-wide trail would run along West End Boulevard from Linden Street and extend south to snake through the soccer fields and connect with the pedestrian bridge where the trail currently ends, Eftink said. The second segment will be the connection from the trail to Shawnee Park ball fields near the Southeast Missouri Hospital pavilion, he said. “The focus of the enhancement grant is really get people from point A to point B,” Eftink said. “Our overall goal is to provide a loop of the city. The trail opens up access to Arena Park, the Aquatics Center, Osage Centre and now up to North County Park,” Eftink said. You can read more about the project and the history of the Cape LaCroix Recreational Trail on PalmBeachBikeTours. I was working and still am at the Quality Car Wash on Mt. Auburn that is next to the million dollar bathhouse of the walking trail. We used to see deer behind the car wash at night before the bathhouse and parking lot was put in. One sunday my son and I rode our bikes down the trail behind James Glass & garage. He thought it had been built futher. So we rode farther with our racing bikes of which didn’t go very well in the fields only to find out, way back there we had come to the end of the trail so far. Was fun getting the bikes back to where we could ride home as we had pushed them for some ditance. A well exercised trip. A year or so later we finally did make it to the end of the tril that ended by the soccer complex.